vodQA Pune was organised on Nov 15, 2014 at ThoughtWorks, Pune. vodQA is a QA centric event and has been running across cities like Bangalore, Pune, Gurgaon for a couple of years now. The venue for the event had a small shift from the previous year as the ThoughtWorks office was a newer and bigger place(though I liked the previous one more). 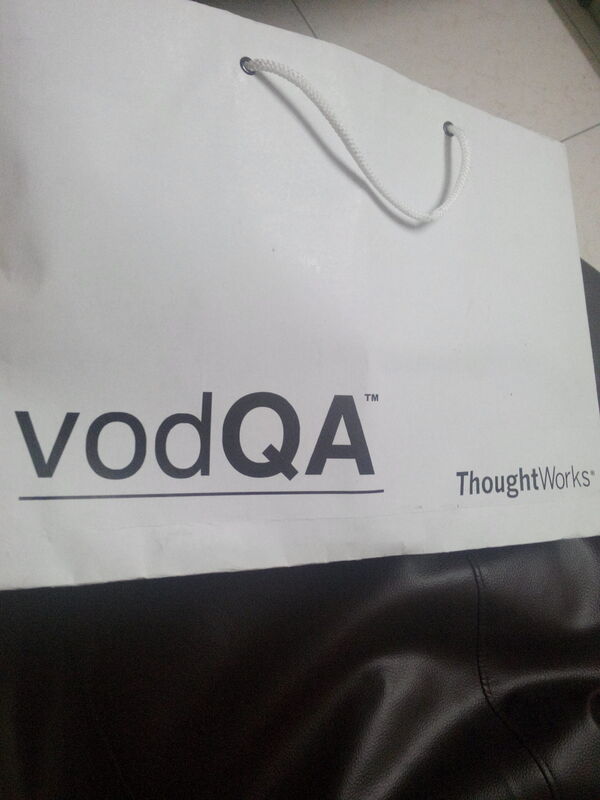 It began with the registrations as usual and distribution of a vodQA bag which contained two badges and a notepad. This time along with the vodQA badge, Selenium’s 10th birthday was also being celebrated and hence the badge for it. The keynote was mid way by the time I joined, one of the striking points the speaker mentioned was ‘looking at the gradually changing scenario, there will be more in-use cell phones than there are people on the planet right now’. The speaker touched upon some topics like Continuous Delivery, cross platform testing, testing in production(coming up near future) and so forth. This time, vodQA was scheduled differently #experimenting. There were three parallel tracks for talks/workshops scheduled for the day with each candidate being able to attend a set of 2 talks + lightening talks + 1 workshop + open space session. You can check the schedule here. From the available three choices, I chose to attend “Migrating Cloud Management Infrastructure to Openstack and Testing Challenges” where the duo discussed some of the testing challenges in shifting from Rackspace to Openstack. They started with a brief introduction to the components of Openstack which was helpful to understand the basics and connect. This talk also had the mention of ‘testing in production without effecting the business’. Another talk was about identifying risks and vulnerabilities in your web application which covered exactly 10 points from OWASP Top Ten Project. Now, there were lightening talks pre-lunch which were simply awesome. “10 myths about QAs” was delivered by Kushal aka ‘Baba’ which covered something near to reality mentioned in the next few lines. When you say “QA”, the first question which comes up is ‘Manual or Automation’, even if a QA does test automation, he cannot escape the manual part of testing, so why do people even ask such questions? Anyhow, believe it or not, manual testing is an art and test automation has it’s own advantages. Does your project manager expect you to do 100% automation? Really? Automation is just not one person’s responsibility, but that of a team. Are the tests breaking? Why is the developer looking at you, is the QA responsible for it? He summarized his talk saying that a QA does more than just test. Another lightening talk was on “Personality Driven Testing” by Jesal which was entirely a new thought and just touched upon some different types of personalities of a person and what approach would that person take at work in order to test an application. Though initially I wondered, is it some new kind, never heard of this term before.. the talk had good stuff. The last one “5 reasons why every QA need not ‘cross the boundary’ to white box” was by Deepak where he emphasized on manual testing being an art and mentioned about crowd-sourced testing. By now, every one is super hungry and wanting to break for lunch. During lunch time, there was a cake cutting ceremony ‘Selenium’s 10th Birthday’ followed by the regular lunch. I happened to talk to few folks over lunch, this time I could see a couple of new faces who have come down from ThoughtWorks, Bangalore. I met a couple of known faces and one of them was Vatsala whom I met at Tech Jam, Pune and she mentioned that my session there had been helpful to her in some way (felt glad). The discussions at lunch time revolved around Galen Framework and some load testing tools. After the lunch, there was open space where 6-7 topics were selected based on up-votes by the attendees. The topics covered were Agile testing, Mobile testing, test automation, Security testing and few others. The attendees were asked to choose any of the topics and join/form respective groups. The open space is not scheduled, the attendees are required to discuss their topics, share experiences and knowledge. After the open space, there were 3 parallel tracks for a 90 minute workshop. I attended the workshop in Track 1 “How to bring your site down with Gatling” which covered some aspects of load testing. The title was really catchy and it was a full house for this track. The duo gave an overview on some of commonly used tools starting from curl, apache bench, seige, locust, jmeter, and came down to using ‘Gatling’. Gatling is an open source load testing framework which offers a nice reporting format with bar charts and pie charts. It requires to write the code using Scala and you could ramp up the number of users as per your requirement. The hands on session was good while we were trying to break a sample site named ‘dakshina’. The speakers were able to cover good amount of stuff in the given time frame. In all, the workshop was a good learning experience. The closing note was a live example of being agile as the concerned speaker was not able to make it, but was fairly good. It’s time to share feedback and bid a goodbye to this year’s vodQA, a small part of my feedback is a part of vodQA after shots video. Ah! another vodQA came to an end without a vodka shot 😛 😀 . Hi Anisha, Good write up! Was good to catch up with you the other day at vodQA – did you get a chance to take Gatling for a test ride?